The winter weather seems to linger, but I still know spring is in the air. How? I’m deeply into spring cleaning – or should I say clearing – at my office. Purging digitally: I’m always complaining about all the emails I receive. Many of them are lists to which I subscribed years ago. I find I never read them. Instead of simply hitting delete I now hit unsubscribe. My inbox is shrinking as a result. So is my stress. Adjusting my clock: It’s easy for me to work later in the winter because it’s dark outside. With daylight savings time, though, it doesn’t get dark until later. Fortunately, one of my colleagues reminded me of this. I’m leaving earlier now so I can take advantage of the extra daylight. It’s nice to be home at a reasonable hour and still have time to walk the neighborhood or go to the gym. Soon, I’ll be in the garden. Purging: I did something in my spring cleaning that was so liberating. I emptied all my pens and pencils into a pile and then only kept about a dozen. What did I do with the rest? I tossed them! Yes, it was wasteful, but most of them had been picked up at conferences or given to me. No one else was going to want them. And now I can use the pens I truly like. Switching up: It’s been a year since my last spring cleaning so it was time to change the artwork and move the items on my desk. Not only did it make the office feel fresh and inviting, it stirred up some new energy. What’s on your spring cleaning list? What’s on my spring cleaning list? Everything I can put my hands on, because my spring cleaning usually turns into summer cleaning, fall cleaning, then winter cleaning — and I’m never done because something is always out of order. But I keep trying to tame my lack of an organized desk — and when I get it figured out, I’m writing a book — because all the books I’ve read have yet to change me. 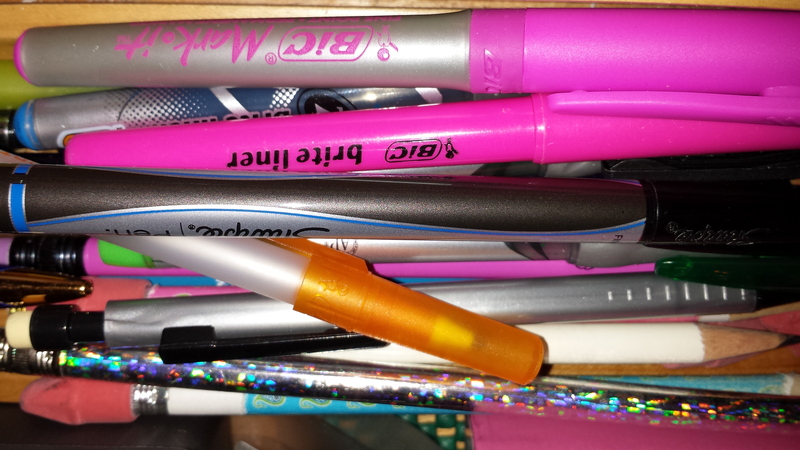 As as for those pens you tossed, I would have put them back in the office closet for others to use — and for me to grab when I can’t find any on my desk, which is why I could probably find the same amount you found when spring cleaning. But spring cleaning must go on hold for now. I’ve got story deadlines to meet. And for that, I’m organized, even though my desk isn’t.